Do you work at Daphne? What did you think of Daphne? 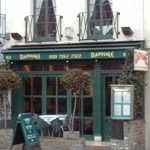 Daphne's do yummy Greek food - and we're not talking a few cubes of feta either. Order a platter and dip in with mates. Just don't forget to tip Daphne after you've sampled her fabby cooking.